How to create discount / promotional codes? 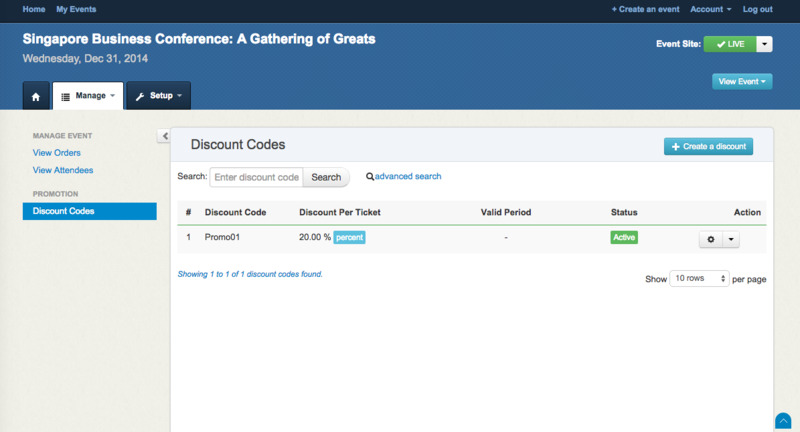 You can create discount codes for your tickets through EventNook as well. To create a discount code, follow these simple steps. Open up the "Manage" menu and click on discount codes. You will be linked to this page which shows you a list of discount codes that have been created for this event. Click on "Create a discount" and a form will come out for you to fill in the details for the discount. Under "Other Options", you can set the minimum and maximum number of orders that can be made using your discount code. You can also set the period when the discount code will be valid. When you are done putting in the details, click on "Create Discount" and your discount has been created. This would be how it looks like on the page.